We are Portland’s Full Service Towing and Recovery company. Six locations serving all of the Portland Metropolitan area. Easy free-way access to all of Portland’s freeways. Flat Bed Towing for those vehicles, modern, antique, and exotic, vehicles that require special care. Light Duty Recovery Trucks, in the event of any mishaps on or off the road, you can count on us. Service vehicles, for your jumpstarts, flat tires, unlocks, or even if you run out of fuel. We also work with AAA and most other motor clubs. Heavy Duty Towing for your tractor trailer, motor homes and buses. Disaster recovery for tractor trailers accidents. We even offer more service, just ask us. Any time you need us we will be there. 24/7 365 days a year. You can count on us. 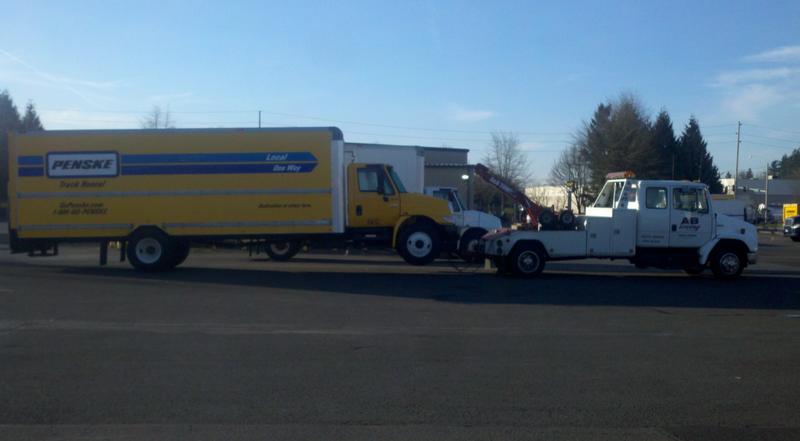 A & B towing has been serving the Portland metro area with all it’s towing needs since 1972. We are family owned and operated to bring you all your towing needs. We have over 20 trucks in our fleet that range from trucks able to tow small cars to trucks that are capable of towing tractor trailers, motor homes, and buses. We specialize in disaster recovery for tractor trailers accidents. A & B also works with AAA and many other motor clubs for your convenience. Whether you need your car towed to the shop or you need help fixing a flat tire, A&B towing can be there to help you out when you are in a bind. Need a tow? Get in touch with us today! If you are in nee of a tow, send us an inquiry and we will get back to you shortly!